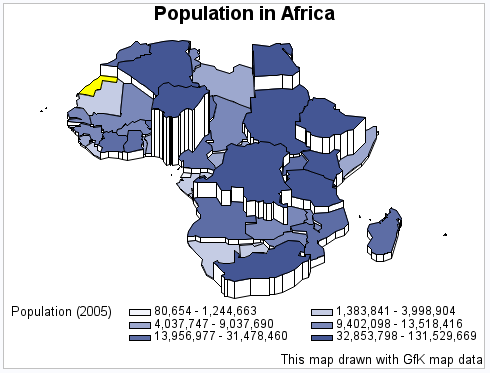 Produce the prism map.The WHERE= clause in the DATA= statement includes the countries that are part of the continent of Africa. The WHERE= clause in the MAP= statement excludes lake areas. The ALL argument specifies that the output should include all of the map areas from the map data set, even if the response data set DEMOGRAPHICS does not include an observation for the map area. The output shows 1 such area. The ID statement specifies the variable in the map data set and the response data set that defines map areas. The CDEFAULT= option sets the color of map areas that have missing data. The RELZERO option makes the prism heights relative to zero.